Popular Scioto Woods! 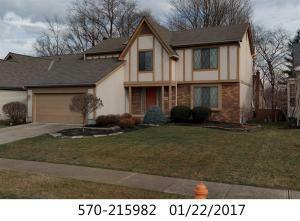 Close to OSU, Downtown Columbus, Upper Arlington, several golf courses, city park in the subdivision and easy access to the airport. Home is in great shape, but does need some updating and is priced accordingly. Spacious floor plan with 2250 Square Feet. 1st floor den. Formal Living Room, Dining Room and Family Room. Nice deck out back on a treed lot. Don't delay--see this one on opening day, December 4, 2017!